You must do passing drills and never assume your players are good passers. Poor passing will destroy an offense faster than anything. Crisp accurate passing and receiving make it all work. Many turnovers are related to bad passing or receiving. All players must become good at the chest pass, bounce pass and overhead pass. Have your players line up facing a solid wall, about two feet from the wall (or a toss-back rebounding device). Each player begins rapid fire passing against the wall, moving back about two feet with each pass until 10 feet away (5th pass). Then he/she starts moving closer to wall by two feet with each pass, until 10 passes are completed. Repeat this 10-pass cycle until each player has made a total 20 passes. Make sure good passing technique is used, and passers step-into the pass. Use groups of four or five players. There is one passer about 6 feet away from and facing a line of receivers (the rest of the group). The passer has a ball and so does one of the receivers. On "Go", the passer passes quickly to any receiver, and the receiver who already has a ball passes simultaneously back to the passer. The passes keep going back and forth to any receiver who does not have the ball. Do as many chest passes as you can in 60 seconds and then rotate. Use good passing technique while keeping your eyes focused forward and not directly at the receiver. Have your hands up and ready to receive the pass. Use your peripheral vision to see the incoming pass. Have each player get a partner, and each pair has a ball, so they can "play catch" with each other. Have the partners separate about 12 - 15 feet (comfortable passing distance), and face each other. Have the players practice each of the three basic passes, starting with the chest pass. Demonstrate the proper techniques with "stepping into" the pass with one foot forward. Snap the pass, with the thumbs going through the ball and extending toward the receiver. Make sure the players pass the ball crisply, and not "lob" their passes. Hit the receiver in the chest. The receiver should show a target with his/her hands extended toward the passer. Feet should be squared and shoulder-width apart. After catching the ball, receivers should get into triple-threat position before making the next pass. Next, work on the bounce pass. Again, passers should start from triple-threat position. The ball should hit the ground about three-quarters from the receiver and bounce right to his chest. Make sure passers are passing the ball with their hands waist to chest high - not over the head (we do not believe in an overhead bounce pass). Next, work on the two-handed overhead pass or outlet pass. Have the partners move a little farther apart, so that you are working on a longer pass. Players should snap their passes with some arc, but be sure that they are not lobbing their passes too high. The arc should be just enough to get over the extended hands of a defender, but not so high that the pass "floats". This pass can be thrown hard, and is effective as the outlet pass after a rebound, to start the fast break. It is also good for throwing over zone defenses ("skip passes"). To simulate the outlet pass, after receiving the ball, have the passer turn his back to the receiver, then simulate pulling the ball in, pivot, and make the overhead pass. Passing Drill #4 - "Monkey in the Middle"
Form groups of three. Each group has a ball. Line up the passers about 15 feet apart (comfortable passing distance). The third man in each group is the "monkey in the middle" and tries to steal or deflect the ball, while the two outside players try to pass to each other. No dribbling is allowed, except for a one-bounce sideways dribble to open a passing lane. No easy lob passes over the defender are permitted. Passers should be in triple-threat position and work on pivoting and ball fakes to clear the passing lane. For example, the passer can fake an overhead pass to get the defender to raise his hands, then make a bounce pass, or "curl" bounce-pass. Rotation:There's a couple ways of doing this. One easy way is to simply change the middle man every minute, when you blow the whistle. Each person takes a turn in the middle. Or, whenever the defender deflects the ball, the passer now becomes the "monkey in the middle". If no deflections in 30 seconds, switch defenders. (1) Defender plays up tight on the passer (Diagram A). After the pass is made, the defender sprints to the receiver and again tries to deflect the pass. The new passer may not pass until the defender is in position and the defender says "go". (2) Defender plays tight on the receiver, trying to deny the pass. The group is confined to a given area on the floor. The receiver must try to get open by V-cutting, back-cutting, making contact with the defender and "bouncing off", etc. Try this "triangle" passing drill for some variety. This drill can be done well by younger players who are not yet adept at full-court drills, such as the weave drill. You can use both baskets and divide the squad into two groups. At each basket, create three passing lines about 12 to 15 feet apart. One line is at the top of the key, another in the right short corner area, and a third in the left short corner area. As an option, you can use cones or marks on the floor, so that the lines don't "creep" inward. To run the drill, start with the ball at the top of key (point) and either pass to right or left (can go either direction). The players start behind the cones, step out to receive the pass and pass to the next station in same direction. After the players make their pass, they sprint to the next line in the same direction as the ball, following their pass - no walking. After a few sequences, change direction and also alternate between chest passes, bounce passes, and overhead passing. This drill goes quickly and keeps them moving, providing a lot of touches in a short amount of time. Make sure correct passing techniques are used, that the players "step out" to meet the pass, and that the players receive the ball and place it in triple threat position. 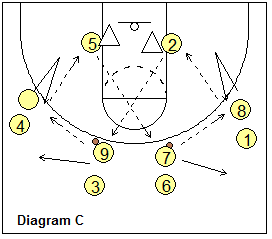 Use three guards and three post players. You can divide your 12-man squad into two groups and use both ends of the court. O1 is at the point. Place two defenders just above the elbows (like against a 2-3 zone). Put a defensive post in the middle of the lane, and two offensive post players half way up the lane on each side. Your point guard (O1), will dribble penetrate and split the two defenders and pass to either post player. The X3 defender will try to deny this pass. The receiving post player can either shoot, make a power move to the hoop, or dish off to the opposite post, who finishes the lay-up. Often I see kids make a bad pass because they actually threw the ball before first locating their receiver (especially against a full-court press). Players must learn to look before they pass! With this drill, the passer must first find the receiver before making the pass. Use both baskets. Have a line under each basket. The first player in line (player #1) speed dribbles out to the three-point line, makes a jump stop and a reverse pivot. Meanwhile, the next player in line (player #2) sprints out to either corner and yells "ball, ball, ball" (mix it up so the passer has to look to find the receiver). The passer makes the crisp chest pass to #2, cuts to the hoop, receives the pass back from #2, and finishes the lay-up. #2 rebounds, and now becomes player #1 and dribbles out and repeats the drill. Having problems feeding the low post? Oftentimes, passers must learn to read the post defender and make a one-dribble adjustment in order to create a better passing angle. If the post defender is playing on the high side, the perimeter player should take one dribble toward the baseline and feed the post. Bad passing, turnovers a problem? Use this drill. Playing in the half-court, teams go 3-on-3. The offense must make 10 passes without losing the ball, or making a turnover (double-dribble, traveling, etc). Offensive players must pass, cut, dribble, screen, move, maintain spacing, etc. The offense does not shoot or attempt to score, but maintains control of the ball for 10 passes. Rotate offense to defense. If the offense completes 10 passes, they don't have to play defense that rotation. 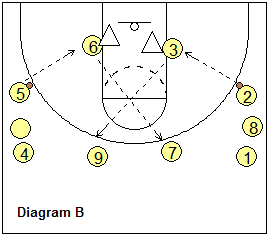 Here's a good team passing drill used by Sherri Coale (University of Oklahoma Head Women's Basketball Coach; back-to-back NCAA Final Four appearances in 2009-2010; 10x Big 12 Championship Coach). Also see the video below. Diagram A shows how the drill is started. Two balls, each top player (O1 and O4) pass to the wings. The wings O2 and O5 first V-cut and receive the pass in triple-treat position. They then make a curl bounce-pass into the low post (diagram B). The post player chins it and then skip-passes to the opposite top player. And from here, the drill constantly repeats, with the pass from top to wing, wing to low post, post to opposite top (diagram C). Player rotation... use two assistants as post defenders. Place extra players at the top spots. After passing to the wing, the top player goes to the wing line. The wing player moves to the low post and the post player moves to the opposite top position... players essentially just follow their passes to the next spot. Points of emphasis... we want 25 "clean" catches. Wing players must make good sharp V-cuts and catch in triple-threat position. Everything must be "game-speed". 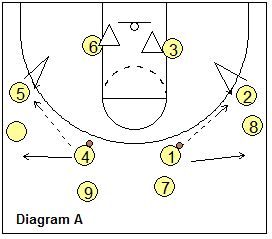 Wings make a good step-around bounce-pass into the post. Perimeter passers should use this drill to also practice pass-fakes. Receivers should call for the ball. Practice with good habits.